This class was filmed over the course of six months from November 2017 through April 2018, and is comprised of six full length lessons with PDF walkthroughs, playlists, and speed paintings for your entertainment and inspiration. 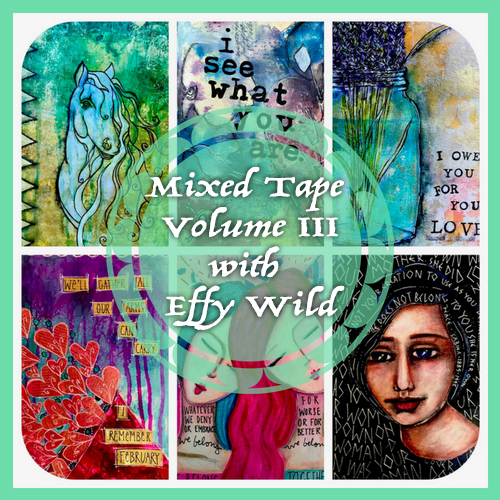 Each lesson is inspired by a song in the soundtrack of my life, and includes technique based tutorials, including graphite transfers, ink blot paintings, water colour + acrylic, painting with papers and paint over collage, whimsical portraits with limited mediums, and paint over gesso transfers. Released month by month on Patreon, all six lessons have been moved over here with instant, forever* access to all content. If you’d like to follow along with the creation of Mixed Tape Volume IV, you can join me on Patreon at the $5 (speed painting) or $10 (full length tutorial) reward levels. Patrons will get the complete Volume IV classroom experience (with forever access) for half price once it has been completely filmed and moved over here. If you love the idea of building an art journal practice that is inspired and informed by music, you are in the right place!